Working in a specialty occupation sometimes necessitates a high limit Disability Insurance Plan. Unfortunately, for highly compensated employees such as Commodity Brokers and Stock Traders, sufficient amounts of disability insurance can be difficult to obtain from traditional carriers. 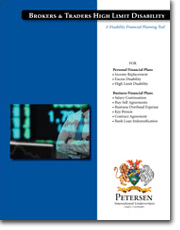 Petersen International Underwriters designed the Brokers and Traders Disability Insurance Plan to provide men and women with the income replacement coverage they require. These professions can be unpredictable and are sometimes uninsurable by the traditional market; however, a disability insurance policy is one of the most crucial parts of a sound financial plan. Mr. B has been a commodity trader for 15 years. His income can and does fluctuate dramatically year by year, but has always provided him with a very good standard of living. But his roller coaster income had created a declination from the traditional markets. With creative financial underwriting Petersen International Underwriters was able to provide Mr. B with a proper amount of disability insurance to protect his family’s financial health. If a disability leaves your client unable to work, our Brokers and Traders plan will save him or her from financial ruin. A sufficient DI plan makes it possible for your disabled client to pay his or her mortgage and utilities bills, buy clothing and cover school costs for his or her children, as well as put food on the table every day. Cash flow is critical when you’re unable to work for an extended period of time; PIU’s Brokers and Traders Disability Insurance Plan will allow your clients to maintain their standards of living. With monthly benefits available up to $100,000 or more and lump sum benefits up to $50 million or more, the high incomes of Stock Brokers and Commodity Traders are easy for PIU to insure. So if your highly compensated clients are unhappy with their current level of income replacement disability insurance, PIU’s Brokers or Traders Disability Plan will provide proper coverage.